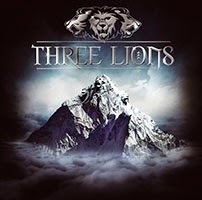 RockUnitedReviews: THREE LIONS: "Three Lions"
The very first thing you'll notice about U.K.'s Three Lions and the opening track of 'Trouble In a Red Dress', the smashing fret work of Vinny Burns (Dare, Ten). It's the distinctive sound of the six-string bender and his singing guitar. Darn flashy, upfront in the mix, and probably inspired by Gary Moore? The other two Lions or if you prefer Pussycats? fellow ex-Ten/Dare drummer Greg Morgan and vocalist/bassist Nigel Bailey. Hold the press and re-do the frontpage as the following statement may come as the complete surprise. Out of the blue? Ehem. certainly not! Their debut album, basically the watered-down version of Ten? also considering that Ten sounded like the watered down version of Dare (mega classic debut), this is extremely safe and mid-tempo. British meat and potato AOR for the average person including egg, bacon, bangers, black pudding, fish and chips. Dessert? Deep fried Mars-bars of course. Hardly anything new on this platter, merely the standard slop of leftover and over-cooked material, served cold and the lack of spice and special ingredient is prominent. On the other hand, you can't go completely wrong here if you enjoy the clinical and sterile sound of any of dozen albums in the style of Ten's Gary Hughes (not to be confused with Glenn 'The Voice' Hughes). Nigel Bailey sings in a similar pitch and style and it's AOR inspired by listening to lack-lustre albums from U.K. artists such as Chris De Burgh and Moody Blues. My favorite tracks, the instrumental "Sicilian Kiss", and "Two Hearts Beats As One". The latter 80's Pop in disguise and I notice that producer Alessandro DelVecchio gets the co-writing credit.